Between noon EST on Thursday, Jan. 23rd, and noon ESt on Friday, Jan. 24th, get a free, custom-printed swatch of our Silky Faille fabric, along with free shipping. Silky Faille, a recent addition to Spoonflower's line, is an elegant fabric perfect for apparel, as well as curtains, pillows and other home dec projects. It offers crisp, bright color, drapes nicely, and holds up perfectly to repeated washing. For 24 hours, we're offering one and all the chance to get a free 8 in. x 8 in. swatch of Silky Faille printed using any design available in the Spoonflower marketplace, or a swatch printed using your own design. HOW DOES IT WORK? This offer is limited to one free swatch per customer. To activate the discount, use the Get A Free Swatch button (visible on each fabric design page) to add a swatch-sized piece of Silky Faille to your shopping cart between noon EST on Thursday, Jan. 23 and noon EST on Friday, Jan. 24, then proceed to checkout. The discount will be subtracted from your cart total automatically. Note that in order to receive your swatches, you need to follow the transaction through to the order confirmation page. [And yes, shipping is free, too.] This offer works for your own designs or for any of the designs available for sale in the Spoonflower marketplace. Offer is limited to ONE SWATCH PER CUSTOMER. Offer is good for a single, test-swatch size (8"x8") of Silky Faille, with free shipping. One free swatch per household. If we determine that multiple promotions have been used by a single person or household, we reserve the right to cancel the orders. 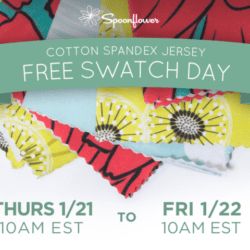 To take advantage of this offer, use the Free Swatch Button visible on each Spoonflower fabric page to add the promotional item to your cart. Then enter your shipping information and complete checkout. 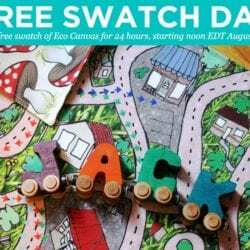 Free Swatch Of Eco Canvas For 24 Hours! Thank you SO much for this generous offer! I can’t wait to see what this new fabric is like. Many thanks. looking forward to seeing this new fabric!! . . . wonderful way to showcase your newest addition!!! . . . thank you! I just found out this site and this free offer is perfect to see how good is the fabric. Thanks a ton! 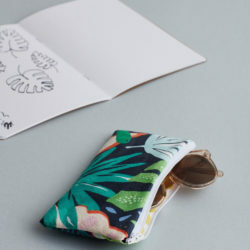 I just think it’s wonderful….that you’ve finally added another type of fabric to your list! Also, I simply love logging on to Spoonflower to do my designs! I’ve enjoyed designing my own custom fabric…it’s fun, therapeutic and relaxing for me! Designing fabric has been something that I’ve always wanted to do. To attend an art school just wouldn’t help me…at all in order to learn how to design fabrics! I wouldn’t mind being a freelance fabric designer! But, I’m sure I’d have to attend an art school and get a degree for that. I don’t have a college degree…but, learned to design my own clothes from scratch back in 2001. I love my own ideas, and I like being creative. I like coming up with many different designs and doing many different things! Now, I’ll admit…I’ve not been much into home décor…but, when it comes to fashion…that’s where my strength is! Math is one of my worst downfalls of all academics! My academic life had not been very successful, at all. I’ve failed Math twice, and I’ve flunked Reading five times. But, when it comes to Art….I’m a pro! I have a good eye for fashion…and, I love clothes. There’s not a day that goes by that I don’t think about clothes. Sewing…and making clothes is pretty much all I think about. I just love the idea of creating nice things…and I’m thankful that God had blessed me with the ability to do so! Thanks so much for this! I’ve been on the fence about how to proceed with my scarf designs and really wanted to see how it looked on this. But somehow I hadn’t gotten around to it. This gave me the push I needed to go ahead. Thank you so much for the free swatch. Can’t wait to see the hand of this fabric. I’m looking forward to seeing a beautiful design on the silky faille and thinking up a design for one of your contests. You’ve got me inspired now! Thank you so much for offering this worldwide. I’m on the west coast so I missed the cut-off time for this. Hope you offer it again! Fabulous collection i have found! Designing the most elaborates and expansive room to the smallest of living spaces, one common foundation remains. Good fabric. « Win 2 Craft Books + a Quilting Rubber Duckie!